Nitroglycerin is one of the world’s most amazing inventions. It has a lot of properties that make it very useful for use in many different ways. If you heat nitroglycerin, it will explode. It has been known in many cases to have killed those who are making it. It is a very dangerous chemical, and is often used in dynamite as well as other blasting materials. 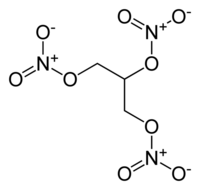 Nitroglycerin has been around since 1847, and despite peoples best efforts, it is still commonly misused today. This page was last modified on 29 March 2009, at 12:45.